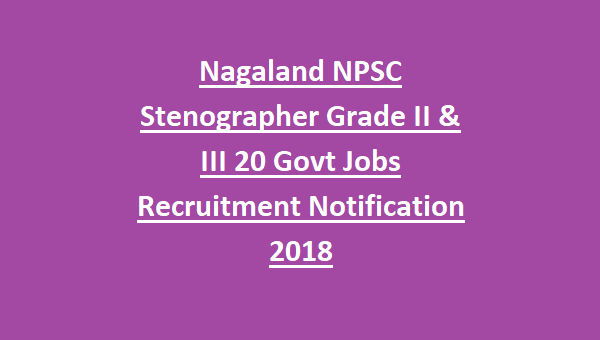 The available vacancies for Stenographer posts in NPSC is 20 posts. The age limit for the candidates apply for the Stenographer Grade II & III posts is in between 21 – 30 years. For Stenographer Grade II – Graduate in any discipline with 120 w.p.m in Shorthand and 40 w.p.m in Typing. 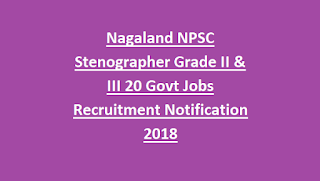 The application fee for the Stenographer Grade II & III Jobs is DD of Rs.300/-. Candidates can pay the fee in favor of Secretary, Nagaland Public Service Commission, Kohima, payable at Kohima. The candidates will be selected on the basis of merit in written examination. For exam pattern and syllabus candidates can refer in the Official notification of NPSC given below. Interested and eligible candidates can apply for the Stenographer posts through offline mode only. Candidates can download the application form through the official website of NPSC is www.npsc.co.in from 10-10-2018 onwards. The last date to submit the application form is on or before 26-10-2018. Candidates fill the application form with necessary information along with the relevant documents and then send to the address of Secretary, Nagaland Public Service Commission, New Capital Complex, Kohima- 797001, Nagaland.